Any other Dak owners on here? I had one, but I sold it & upgraded to a full size. It was a good little truck. Very nimble. I could get it down some tight Jeep trails my fullsize can only dream about going down. I put a ton of money in that little truck, but it needed a solid front axle. 4.7L, H.O. cams, 70MM TB, 4:10's, Torque management removed, etc.etc. 2" torsion bars, 3" body, 33" Cooper ST's on 15x8 Cragar soft 8's. Added Hanson front & rear bumpers later on. Roostin' it up. 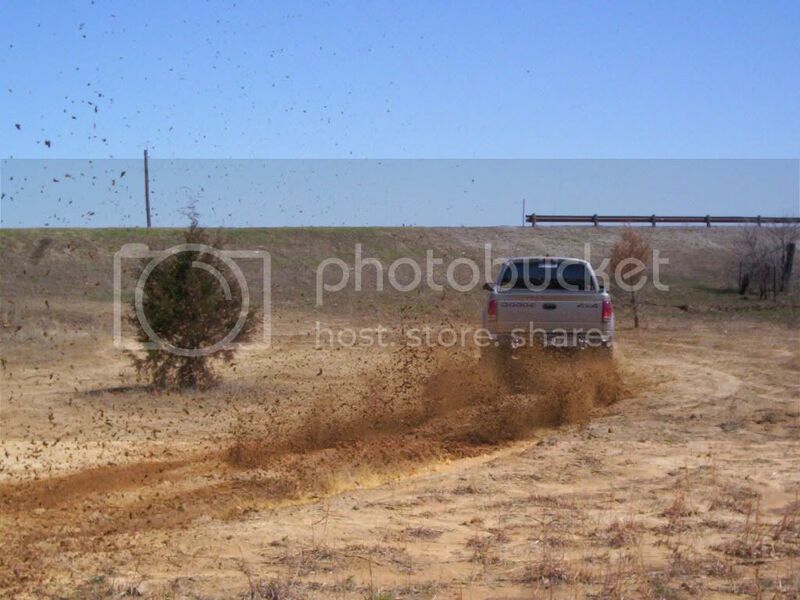 Digital cameras catch all the mud! Last edited by bigmac; 08-11-2011 at 07:54 PM..
Nice Dakota!! That's when they were made well. The 2005-2012 are throwaways. I had one, it was not heavy duty as ordered. I had a 91 Dakota with the v6 in it. Completly stock...and I beat the piss out of it. Lol my dad wasn't happy when I came home with it covered in mud. He told me he should have never got me a 4x4! It had been through 2 wrecks...and sold it with 170K miles on it. Its still running today! Thanks for the kind words guize. 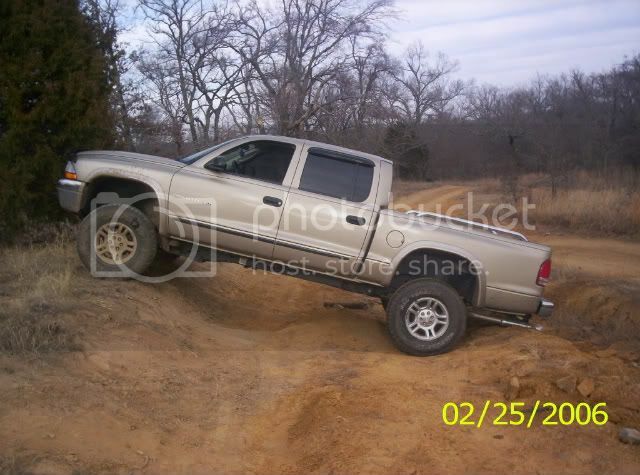 It was a good litle truck. Key word, little. Im 6'3" & at 350 lbs, I was a tight fit. I still see it running around town. The current owner has found out the hard way the Dak IFS is no good for wheeling. He stuffed 35's under it & I think he has busted the front end 2 or 3 times since then! That was my 5th Chrysler vehicle since '98. Man i've had a bunch of rigs since I started driving. It was a good truck. Thats a sweet truck. 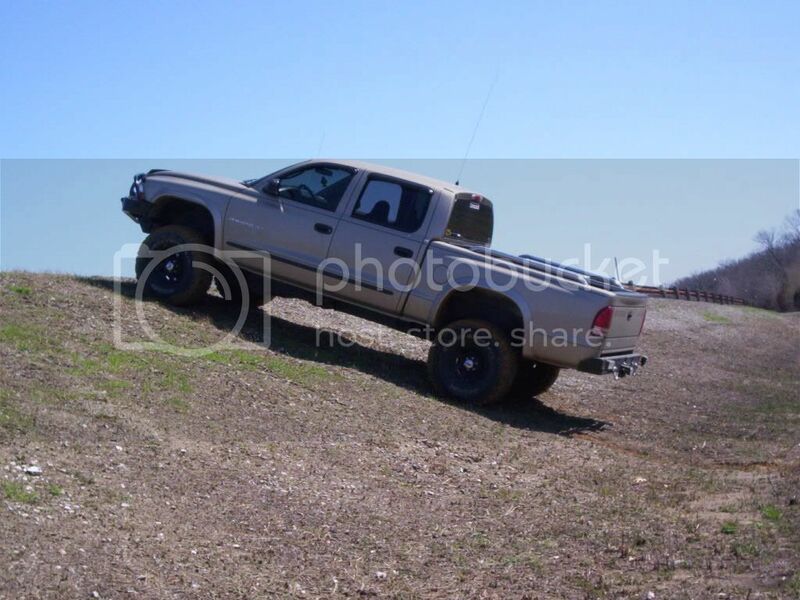 Id love to have something like that to compete with my buddies ranger. The soft 8's and D window wheels are my favorite. I think they just look good. 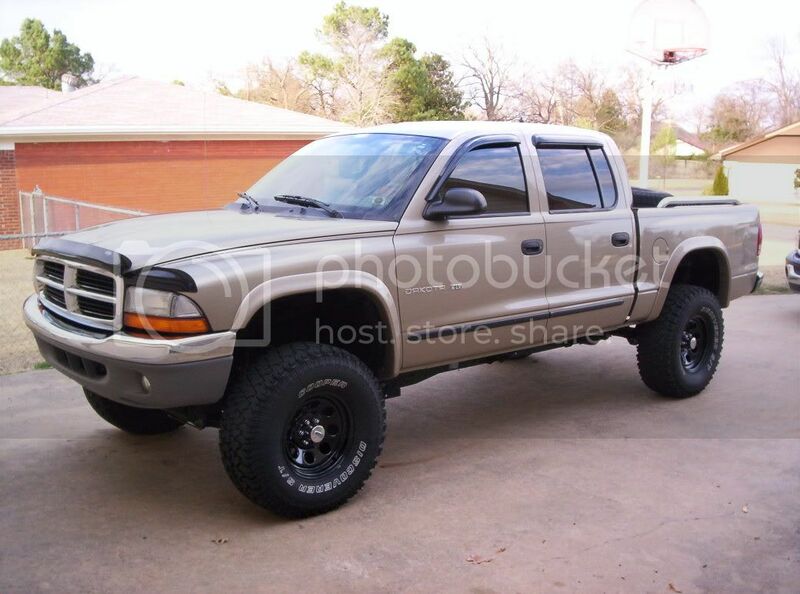 Hopefully i can get a Dak or a power ram or power wagon when i have the money for another rig. Ive always wanted to go off road. Thanks guys. 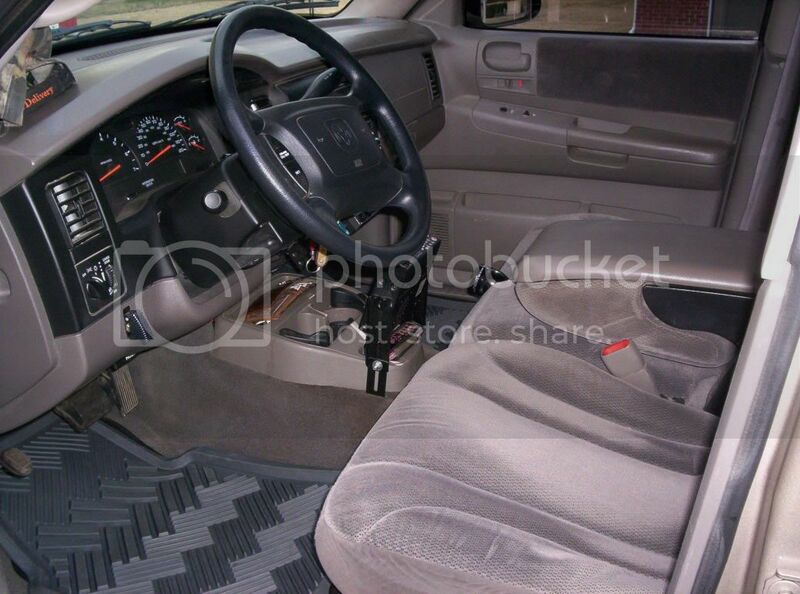 I have to say, outta all the trucks i've had, I kept that one the cleanest. It was squeeky clean 99% of the time. 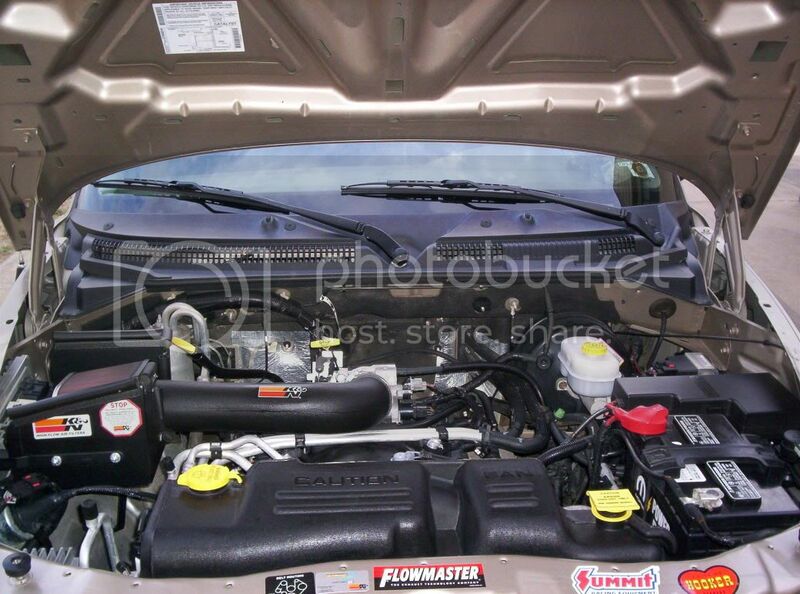 Even the engine bay looked showroom fresh. I can't log on to photobucket at work, but i'll post more pics when I get home. For the record, that little truck had some balls. The HO cams & the 70mm tb woke the little 4.7 up real nice. With the 4:10's, shift kit & the TM removed it would scratch 2nd like a champ. Good little truck. I'd own another one. I never liked the gold/tan color when I was younger. But the more I see them around town the more I like it. Especially when it has black accessories on it like yours did. The bumpers really set yours off well. Nice lookin truck! I had a Jeep YJ back in the day that was the same color. It hides dirt & dust pretty good. Also hides Oklahoma pin-stripes pretty good too! More junk so you pic lovers can get yer fix! I lost all of my bone stock photos during a computer crash a couple years ago. These are the only two I have left of it. Just finished up putting the body lift on & we're out testing it. 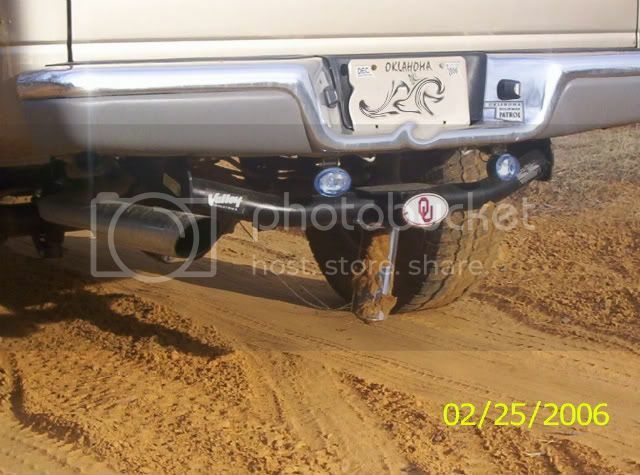 Why I no longer have tailpipes on my 4x4's !! Oopsy daizy !! lol. 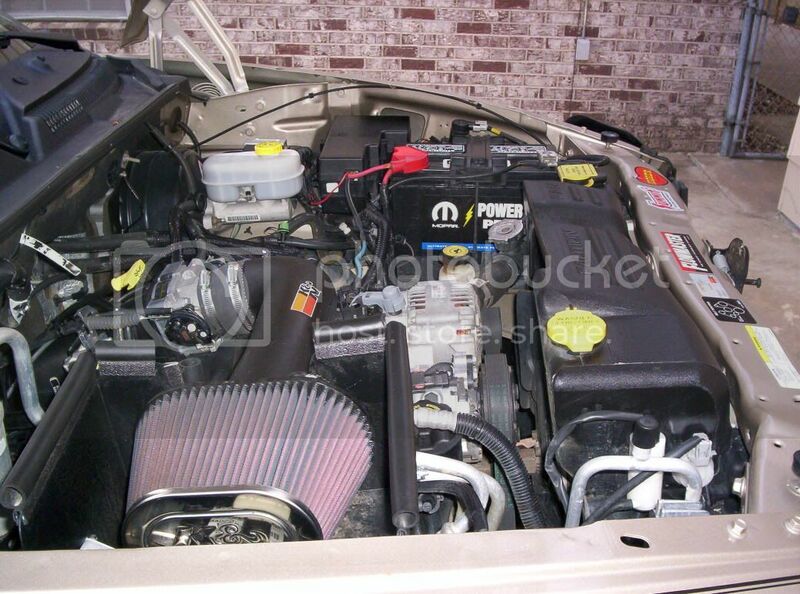 That is one stuffed engine compartment! Looks real good! So did you bent the other pipe so they would look the same? lol. Nope. They got the hack saw treatment. I had them dumped right after this happened. I just can't stand to run tailpipes with nice tips anymore. I always tear them up.